Truck drivers at the Creek Road yam zone in Port Harcourt, have appealed to the Rivers State Government to re-open the trailer park at Iriebe town, in Obio/Akpor Local Government Area, with a view to decongesting the traffic flow at the various off loading points of these trailers. 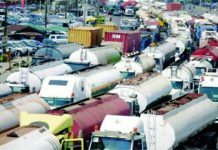 The truck drivers made the appeal in Port Harcourt, following the fourteen days ultimatum issued on them to vacate their trucks off the creek road and the adjoining roads by the team from the Ministry of Environment last week. Speaking to The Tide, Mr Emmanuel Njoku, who brings yam tubers from the northern region to Port Harcourt, said the indiscriminate parking and off loading in the area emanated from the closure of the trailer park at Iriebe town near Oyigbo. He noted that the park was built by the Rivers State past government in the 1990s and was later closed from use and abandoned. According to him, “the park was serving a great purpose for both the yam dealers and the truck drivers, because yams are off loaded there and buyers come, pay and distribute to their various marketing/retail outlets, thereby ridding the city of heavy truck and traffic congestion. But the situation since that place had been closed, remains that trucks coming in to Port Harcourt from outside the state discharges its goods directly at the retail outlets, thereby causing traffic congestions at the various points, especially, at the creek road, one of the biggest yam retail outlets in Rivers State”, he added. Mr Njoku who hails from Etche Local Government of Rivers State, revealed that part of the trailer park land at Iriebe have been encroached and built upon by private individuals and urged the state government to hasten up and retrieve those encroached plots of land before the tresspasser takes over the entire place. Saying that he is optimistic that Governor Chibuike Amaechi being an action Governor would one day remember to include the trailer park project in his people-oriented developmental programmes of the state. While appealing to the state government to come to the aid of the truck drivers by revisiting the project, he advised the truck drivers and yam dealers to always support government policies and aspirations.